Please fill out and submit this form in order to enroll in summer school. Last date to register online is May 31st. Late registration is available in person at the Pali Academies office June 17th and 18th from 8am-12pm. It is important that you and your parent/guardian watch this entire 2 minute informational video before continuing with this application. You may view the closed captions in SPANISH by clicking on the "cc" located at the bottom of the YouTube menu bar. Student PCHS Email* This field is required If you have never accessed your PCHS gmail the default password given to each student is their first and last initial followed by their 6 digit birthdate. Email parenttech@palihigh.org if you need your password reset. Student Cell Number Leave blank if you do not have a cell phone. 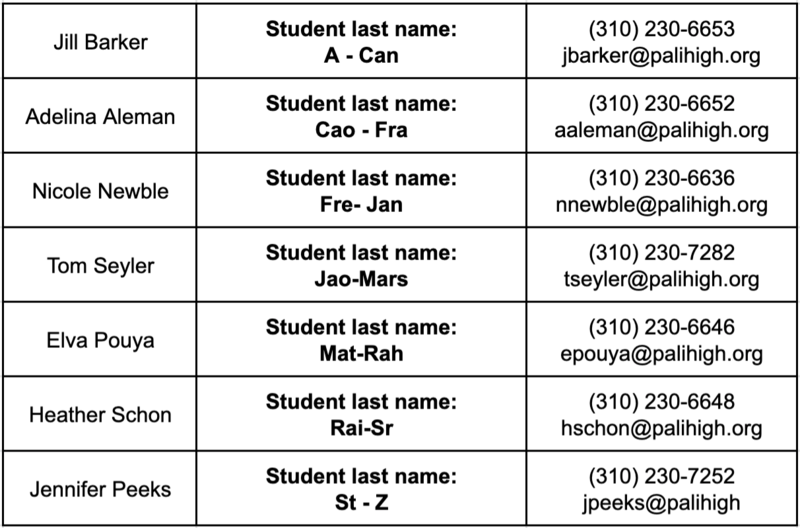 Select your PCHS COUNSELOR* This field is required Refer to the previous table if you don't know who your counselor is. We ask that you select your FIRST and SECOND choices for summer school courses. You are NOT GUARANTEED either of these selections. Your application will be reviewed by your counselor in order to make sure you are taking the right courses to meet your graduation requirements. You and your parent/guardian will receive an email once your applcation has been processed stating which class you will be enrolled in. By checking this box, I affirm that I have watched the PCHS informational video and completed this application with my parent/guardian.